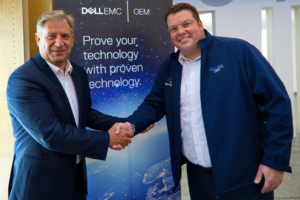 On the occasion of the Dell EMC OEM & IoT fair in Halle (Saale), GRAU DATA and Dell EMC confirm their successful and more than five-year partnership. The new Dell EMC WORM appliances consist of the GRAU DATA FileLock archiving software and Dell EMC hardware. The combination of hardware and software provides companies with secure, automated and audit-proof WORM long-term archiving of sensitive and sensitive data according to the latest compliance guidelines certified by KPMG, according to GoBD, SEC etc. The Microsoft Windows-based WORM appliances seamlessly integrate with existing IT infrastructures, are easy to deploy, require minimal administration, and scale quickly and easily to meet enterprise needs. When stored, for example from a PACS, DMS or email system, the data on the appliances are automatically provided with WORM protection and can then be read, but not changed. Optionally, the WORM data stores can be replicated to a second system to additionally comply with compliance guidelines. The Dell EMC WORM appliances are available in three variants: “Small” up to 8TB (net) of storage, “Medium” up to 25TB (net) of storage, and “L” version up to 60TB (net) capacity. “With the combination of Dell EMC hardware and GRAU DATA FileLock software, we can bridge the strategic gap created by the discontinued EMC Centera, as well as open new markets in the lower end,” said Uwe Wiest, EMEA Global Systems Engineering Director, Central Sales Director Dell EMC and Herbert Grau, CEO and founder of GRAU DATA.